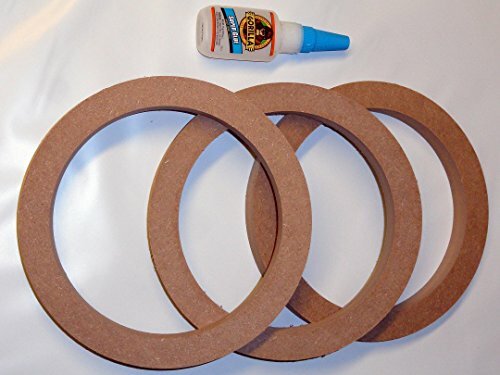 15" MDF Speaker or Subwoofer Spacer Rings Case Pack Each Kit Includes; ( 3 ) Pack of MDF Rings; ( 1 ) Gorilla Glue (glue size will vary) Easily add 3/4" Spacer for Custom Installation. Fits all 15" Speakers and Subwoofers. Made from Heavy Duty 3/4" MDF. Easily Paintable or Primed. Inner Dimensions 13 7/8"; Outer Dimensions 16 1/4 (16.25")" See Picture for detailed dimensions. Easily add 3/4" Spacer for Custom Installation. Fits all 15" Speakers and Subwoofers. Made from Heavy Duty 3/4" MDF. Easily Paintable or Primed. Inner Dimensions 13 7/8"; Outer Dimensions 16 1/4 (16.25")" See Picture for detailed dimensions. If you have any questions about this product by The Electronics PowerHouse, contact us by completing and submitting the form below. If you are looking for a specif part number, please include it with your message.